Over the weekend, I taught S to cross-stitch with waste canvas. We had so much fun stitching together that we decided to share some of our patterns with you today. My mom was doing lots of cross-stitch back in the 1970s, and she designed a bunch of cute little patterns that we used. Since S’s school’s mascot is an owl, we thought it would be fun to add an owl to one of her school shirts. These are my mom’s stick pins and necklace from the 1970s. The stitching patterns are small and easy enough to hold S’s attention, and they’ve got a definite retro feel that I think is a lot of fun. We wanted to share the patterns with you, so I’ve put together a little chart with some of Mom’s designs. You can download it here. Hoot, hoot, hoot! 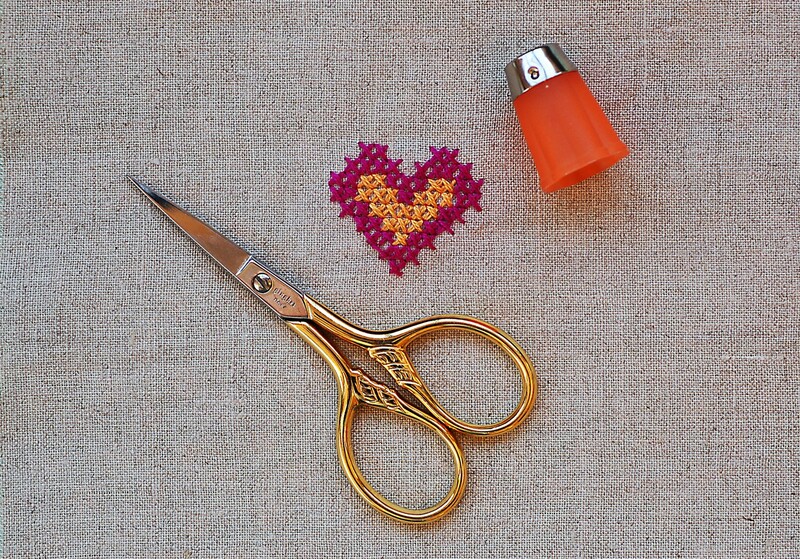 With waste canvas you can make almost anything, like owls, hearts, and even flowers. With waste canvas you can stitch really anything on all types of fabric. Also, it does not take a long time, at all, to learn how to cross-stitch with waste canvas. I believe you should buy lots of waste canvas and make things with it. First of all, the things you make can be so cute! For example, owls turn out beautifully when you are done making them. Like when me and my mom made an owl it did not look so good when we were making it, but it was great when we were done. Second of all, you don’t have to make your own designs. For example, my grandma made these little and cute designs you can get, like the owl, a heart, a butterfly, and even a flower! Third of all, the waste canvas is tiny, and that makes it really useful. For example, the tiny-ness helps because then you can put the things you make it lots more places than if it was big. Like with the owl, it’s tiny so you could put in on pants or a shirt. We’re going to stitch an owl on my school shirt because an owl is my school mascot. In conclusion, you can buy waste canvas right here at Oliver + S right now. Waste canvas is very useful, so if you are ever bored get some waste canvas so you will not be bored. If you’re stitching on knits, it’s always a good idea to back the stitching area with a lightweight fusible interfacing before you start. This helps to stabilize the fabric and prevents distortion. It also helps the stitching to stand out from the fabric instead of sinking into it and disappearing. I gave more instructions for cross-stitching with waste canvas in this post, if you need a refresher on this technique and the simple process behind it. The first time I wash any stitching (including when I wet the waste canvas to remove it) I always put a splash of white vinegar into the water. This prevents the colors from bleeding, which really stinks after you’ve spent time stitching. Mom’s designs include suggested DMC colors, but you can obviously use your own colors instead. S’s next project is the butterfly, and she’s chosen purple, turquoise, and orange for her palette. So obviously she’s not afraid to do her own thing. 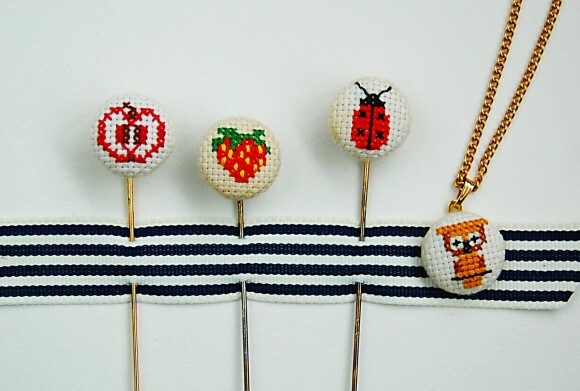 Mom used covered buttons to make her stick pins and necklace. Have you given this any thought? 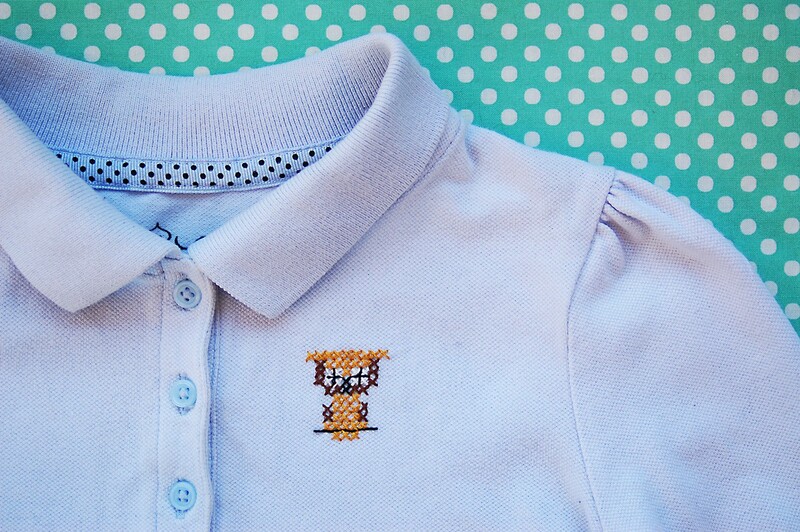 You could do all sorts of fun embroidery for buttons on your Oliver + S sewing projects! You’ll notice on some of Mom’s designs that she’s used straight stitches and backstitches for some of the details on the patterns. Stitch these bits last. By the way, later this week we’ll be introducing the spring patterns. So stay tuned! Cross stitch brought back memories! I’ve printed the patterns and have put them in my floss box. I hope to share them with my granddaughters. Thank you. Excellent sales pitch! ;) I will be purchasing some waste canvas of my very own when the new patterns come out. Looking forward to trying some of the mini-designs! Oh, I love this! S has me persuaded. Let us see your owl-stitched school shirt when it’s done, S! Omigosh so cute. Need to get my mom to teach me cross-stitch. Love these! Tell S her essay was AMAZING, well written and very persuasive. If only my 8yo could write this well. I am impressed! Wow these are great! Totally pinning. I was already convinced on the waste canvas from your previous post, but having a “testimonial” from S really makes a difference! I strongly believe s should have a regular post here as well – I would love to read her reviews of the upcoming patterns. OH I love the cross-stitch and S’s essay – very impressive! Thank you S,you have convinced me! Wow, What a coincidence. I have been teaching my daughter (only 4) to cross stitch and she finished her 1st project (a heart) useing large plastic canvas last night! Its such a joy teaching little ones to sew & she was SO pleased with herself. Before we started on the canvas we spent the weekend useing Hama beads (those plastic beads with the peg boards you can iron to set a design) and a square board to practice following the cross stitch diagrams we had loaads of fun and I was amazed at how quickly she picked it up. I hope to write it up on my own blog this week & include some pictures too. Great essay S! I think you have mastered persuasive writing and if you were writing an advertisement, I’d rush out and buy Waste canvas in an instant. Hermosos bordados, gracias por compartirlos. aaaw these are cute, i think it’s a fun idea to make some during the summer. Thank you for the free paterns , i’m grateful to use them. I’d like to ask, how do you actually make the stick pins? They’re covered buttons, and I think she soldered the stick pin findings to the back. Pretty fun, right? Thank you very much. they are super cute.